One might wonder what the ,,,,,is it supposed to be? What could it be? or just Let it Be! Interesting the asymmetrical balance that causes it to be slightly heavier and move to a point then swing back and of course the Pendulum comes to mind, likeness to a metronome? all these things are questions even the creator ponders. why did I choose to do this? what can I understand about this work? This is a fine work and proud to wonder what the bloody hell it is? The work called "Flight of a Course" as it was in the studio working out the details before showing in the Noosa Regional Gallery, the work is meant to be touched as with most kinetic sculpture it must move and the impetuous is the human connection and action. 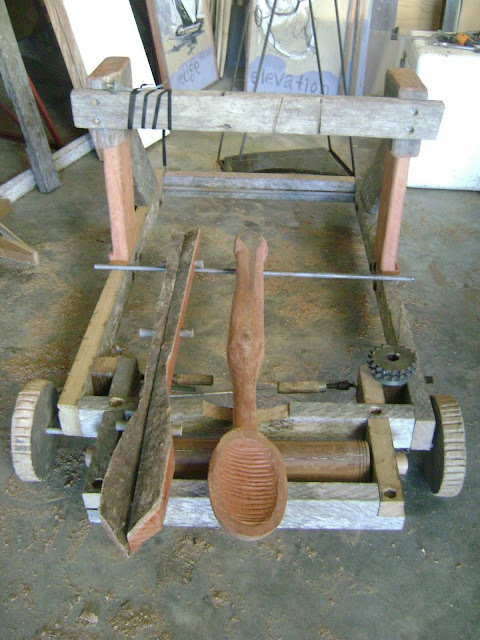 The catapult is a functioning kinetic sculpture that uses a spoon shaped mallet which when released projects an object. The catapult is among the first demonstrations of trajectory from which Newton and other mathematicians could calculate the distance and velocity an object will travel. It also became known as the first military hardware used in combat. Funnily enough this is to me a study of the use of kinetic sculpture as a way of storing energy for the hurling of humour at a government unwilling to do the right thing. Why can't we get smart and stop the burning of carbon? Where is the commitment to funding truly clean energy solutions? It is absolute stupidity for us to keep doing what we know is the wrong thing to do. We teach our kids one thing and do the opposite. Time to fight for what is right and start our own revolution.